These ceramic gloves are very soft, flexible and quite stretchy. 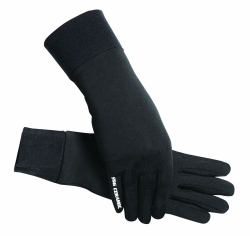 Thin gloves provide dexterity and fingertip touch control while still helping to keep hands warmer. On the bitterest of cold days, your own body heat keeps you extra warm when you wear these liners inside any regular glove. Ceramic fibers infused into yarns of these liners reflect your body heat to your skin. Ceramics are so effective that it is recommended you limit their use to 3-4 hours until you become accustomed to their dramatic benefits.